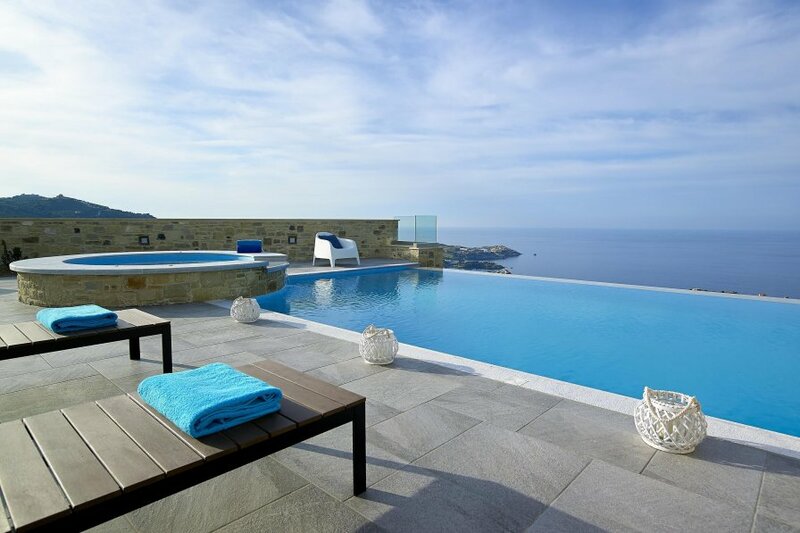 Villa Blue key is overlooking on top of a hill the Agia Pelagia Bay , a place like a piece of art made by nature. Earth and sky collide offering us an unforgettable blue sensation across our field of view. Enjoy your sun tan next to the swimming pool (can be heated with an extra charge), while gazing amazing uninterrupted sea views. Agia Pelagia features two sandy beaches with crystal clear waters and both of them are organized. Blue key villa is in the middle of Crete, very well suited as base of operations for daily excursions around the island. In its 300 square meters of property it has 5 bedrooms, 4 bathrooms and can accommodate up to 11 people. They elegantly decorated and they have air condition, WIFI and balconies offering amazing sea views. On the ground floor there is a fully equipped kitchen with all modern comforts, a dining area and a living room. The latter has a flat screen TV with cable and satellite reception, a fireplace and cozy comfortable sofas with view across the sea. At the outside area of the villa, there are sun beds, a BBQ area, a Jacuzzi, a 40 square meters pool and a children’s pool. A car is essential while staying in the villa and a parking is available as well. Hamam-style steam room, 8 persons capacity, marble- free of charge. TV room with 4K, 55inch smart Tv, blue ray DVD player. Ground floor and pool level are fully accessible to wheelchair. Bedroom with full PWD (people with disability) bathroom available on the ground floor.